Ever since I first discovered the delicious combination of Fage, sugar and an ice cream maker, I've been slightly obsessed with making frozen yogurt. I had some leftover baked apple from the other night so I decided to try out an apple pie flavor, using the baked apple as a mix-in. It was delicious and the boyfriend didn't even realize it was frozen yogurt. He thought it was real-deal ice cream. Mix the sugar and brown sugar into the Fage until all the sugar is dissolved. Add the cinnamon and nutmeg and mix until combined. 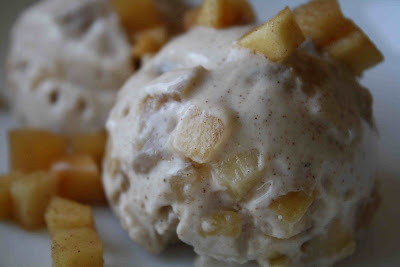 Freeze the mixture according to your ice cream maker's directions and when almost finished, add the baked apple. Let the machine mix in the baked apple before removing to serve or freeze. Enjoy! I wish that I had room in my freezer to put inthe ice cream maker bowl so that I can make this. We used to get an ice cream like this every year at the Johnny Appleseed festival...but yours looks soooooo much better. And the Fage would be fantastic with the apples. I never thought of putting apple pie for frozen yogurt. I am sure it taste delice. Hey there - I put the adopt a blogger matchups up today and you and I are partners :) I look forward to getting to know you! That just look wayyy too good! And it's yogurt!! Mmmhmmhh. Michele - Not that there's room, but mine is jammed in there all the time. Never know when the urge is going to strike. Elra - I have a slightly unhealthy obsession with trying to put new flavors in ice cream or frozen yogurt. Kristen - as you know, I'm so excited! Cecil - Gotta give the love to the Greek style yogurt. I really don't know what I did before discovering it. ttfn300 - Mine was a gift, but after having it for a year now, I would say it is definitely worth the $50 for the midline Cuisinart one! This looks beyond delicious. Love you blog. I am going to be putting in my blogroll! I tried a version of this recipe over the weekend w/ farmers market apples and it was a huge hit. Thanks! The Fage is a brilliant suggestion. It was a little thick for my ice cream maker so next time I'll probably have to thin it out with a little milk, but still, it was delish. This recipe is FANTASTIC! Greek yogurt is my new best friend and it's only brought me and my ice cream maker closer together. Has anyone made this with 2% Fage? I made it with strained whole milk yogurt, but I wonder if I could have made it with 2%.